Tag Archives: mokume gane for metal clay. 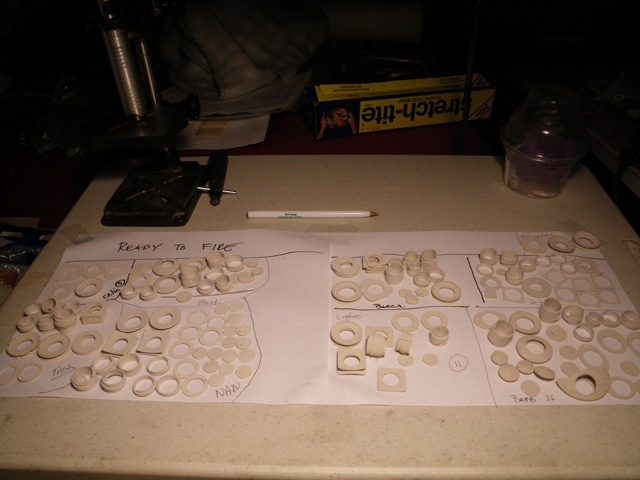 …it was all about the polymer clay. At Celie Fago’s mokume bracelet workshop in Vermont. I should have posted a lot sooner, but I feel like I am still catching up. 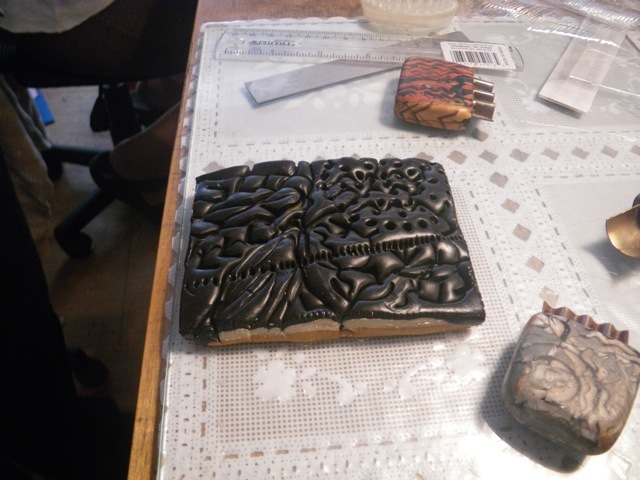 Making the billet for the mokume slices involved mixing a few different layers of translucent color. 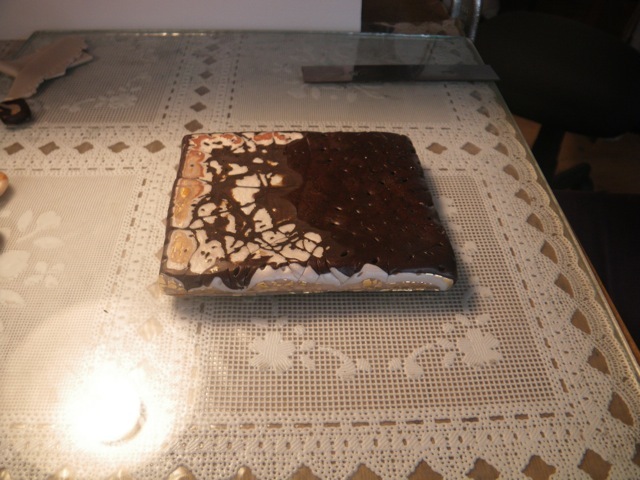 The billets were made with several layers of translucent polymer, separated by sheets of metal leaf, ending with a layer of pearl white and then black. 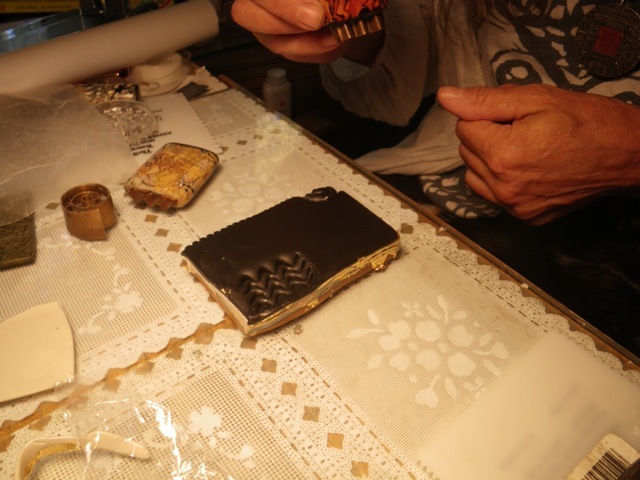 Then it was time to press tools into the clay, carrying the black from the top layer down through the translucent layers. 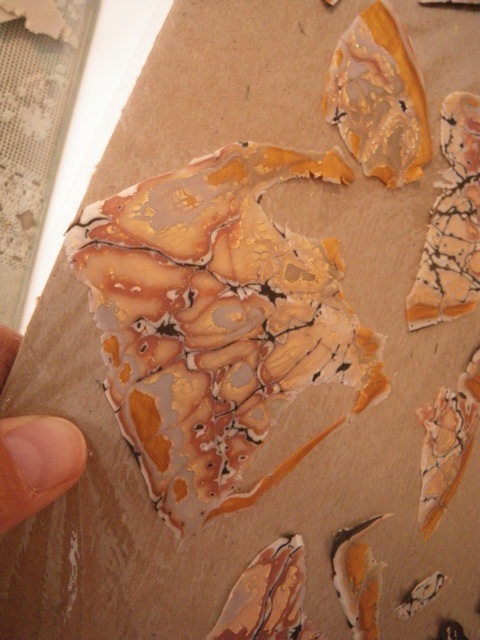 Next, the layer of black was removed, with a tissue blade, to expose the translucent mokume layers below. Holly’s colors above made me think of s’mores. The colors and patterns show up as a surprise, as the thin layers are harvested from the billet with the sharpest of tissue blades. 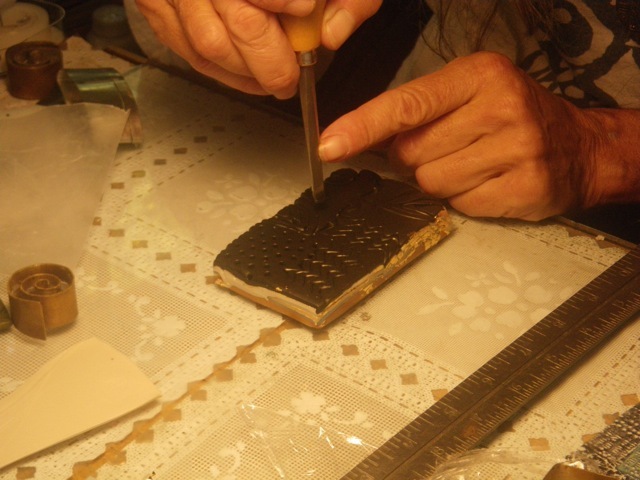 The slices are placed on a layer of translucent clay, then fitted to a bracelet core and pressed on carefully to be sure the long seam butts together. 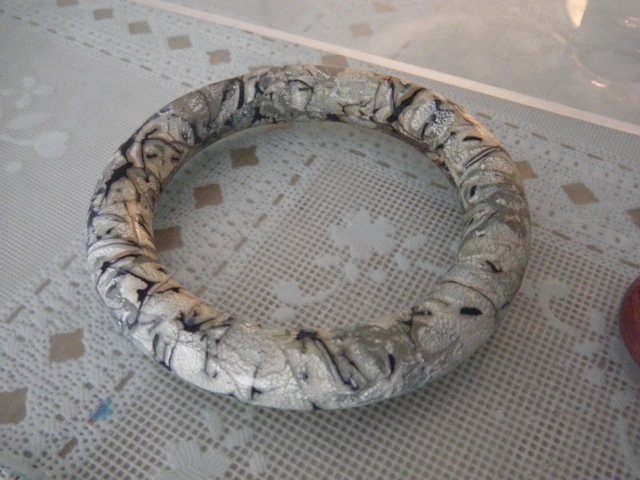 My bracelet, straight out of the oven, will need some serious polishing with various grits of wet/dry sand paper. Then it will be polished with a muslin buff allowing the depth of layers to show through. This photo does not really show the subtle change of color in the bracelet’s layers. 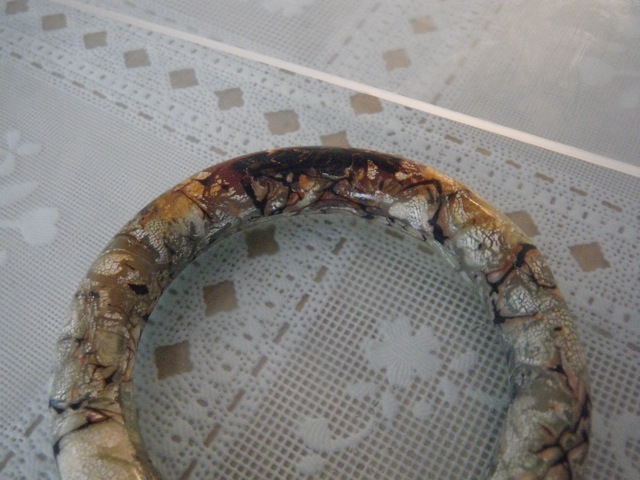 This bracelet is quite a bit larger than something I would usually wear, but I will definitely try the mokume technique again. It will probably show up on beads or on polymer inlays for other silver pieces, or who knows where? On the next attempt I’ll use translucent colors that are not quite as closely related. This will hang around my studio for a while, as a reminder that I have a new technique to master. I won’t pick it up again until probably after Christmas, but the whole time it sits inactive on my bench, my brain will be taking in ideas to try when life slows down in January. The class was comprised of 9 students. 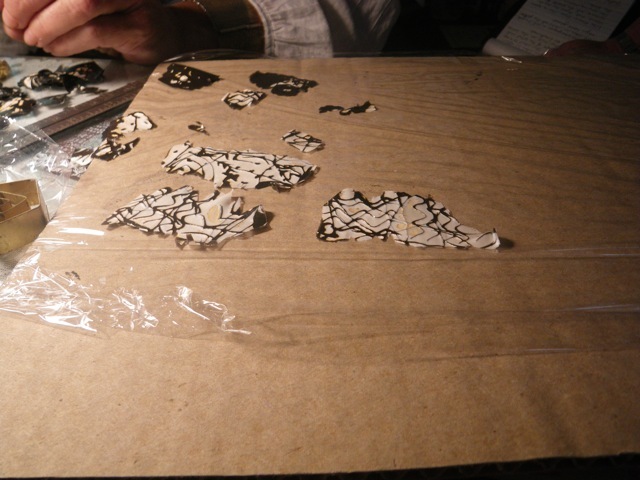 All but two of us had worked with metal clay before. All of us wanted to know more about polymer clay. We did most of our metal clay work before starting the polymer.Which meant that 7/9ths of the class was in their comfort zone, and were perfectly willing to share and teach what we knew about metal clay when our 2 friends got stuck. 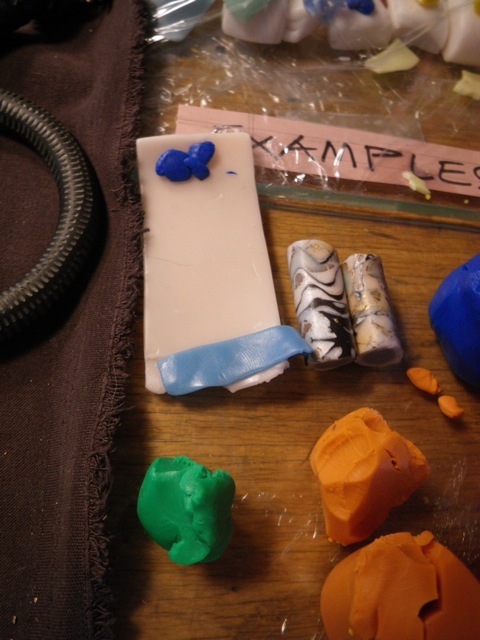 We knew that on the following day, with the polymer, we would be out of our comfort zones and need some polymer advice. 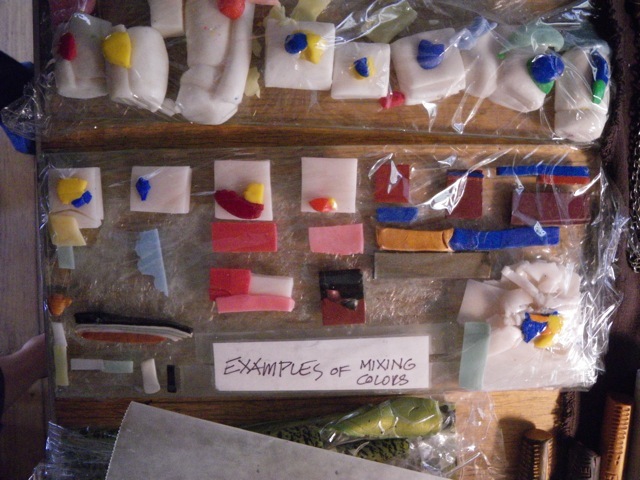 Here’s what happens when metal clay people get together for a polymer clay workshop. 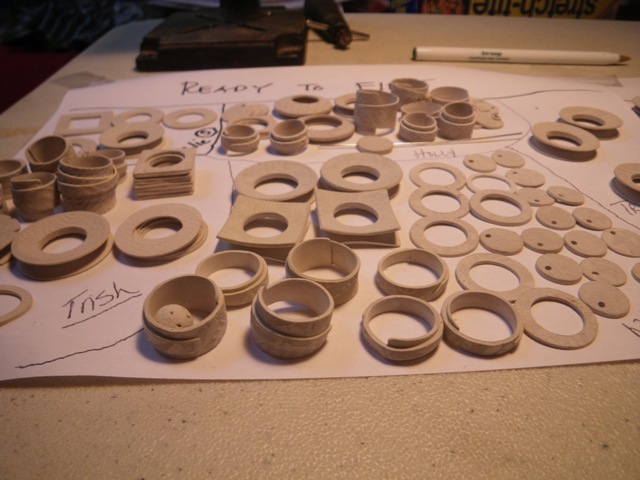 The metal clay portion of the class explodes with work because we are all so happy to know what we are doing! Previous classes have made many less PMC pieces. Everyone was prolific in this class. Even the beginners who found their comfort zone pretty darn fast!